More and more people are leaving the cities and buying small rural properties. Here's a 5 acre farm plan to help them (and maybe YOU) manage a micro-farm to create a sustainable, profitable business. Assumption 1. The farm will be 'natural': We will use organic and sustainable methods to the degree feasible. If you live where you work, you don't want to introduce toxic substances into the environment. Assumption 2. Integrated production of livestock and vegetable crops: Livestock animals are beneficial on a small farm, provided you raise them properly. This means raising them outdoors and not in confinement. And the livestock will add another valuable income stream to your micro-farm. Assumption 3. This is a business, not a hobby: No business starts up without some idea of where customers will come from, or how much revenue is needed, or who will do the work needed on your 5 acre farm. This means we need to think about planning, marketing, and management as well as production. OK, with these basic assumptions in place, let's look at the plan. A 4000-sq. ft. hoophouse for starting transplants and growing early crops. The hoophouse will reside at the north end of the property, to avoid shading crops and also to help provide a windbreak from northerly winds. 20 beehives to help with garden pollination and to produce a cash crop of honey. The bee yard can be on the perimeter of the garden. Assorted fruit trees on the north (an optionally, west) perimeter of the property. 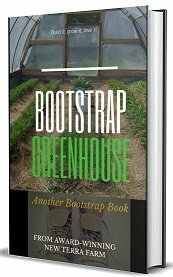 New for 2019 - Get Bootstrap Greenhouse now just $9,and only from New Terra Farm! You grow your market garden on a three-acre section of your farm. The garden area rotates with the animal grazing plot and the cover crop area. The animal grazing area can be planted to forage crops to help with feed costs. Your large greenhouse will start crops several weeks earlier than the outside garden, and can hold flats of transplants from the small heated greenhouse until they are ready to be planted out. Let's assume you are following the Community Supported Agriculture model for your small farm. Here's a quick breakdown of the revenue possible from the above plan. CAUTION: this is an example only, actual income will depend on your market, your model, and your skill as a grower. Expenses will probably go up as you add enterprises as well. This is not the limit; you could add bedding plants for the spring, or a fall planting of garlic, or value-added products for the winter to the mix. You could have laying hens in an 'egg-mobile' in the summer, and house them in the greenhouse in the winter. Lots of possibilities, limited only by your ability to manage.